The October 22nd issue of The New Yorker includes an article by Michael Specter titled “Germs Are Us.” Specter chronicles how our understanding of the relationship between humans and bacteria has evolved since the advent of antibiotics in the early 20th century. We know now that not all bacteria are harmful. Indeed, many bacteria live in symbiosis with their human hosts and confer health benefits including protection from some diseases. These bacteria include all of those we find in our mouth and gut that aid our ability to digest food and ward off illness. Unfortunately, the overuse of antibiotics indiscriminately kill bacteria including those that are our friends. There are many bacteria, however, that aren’t our friends. 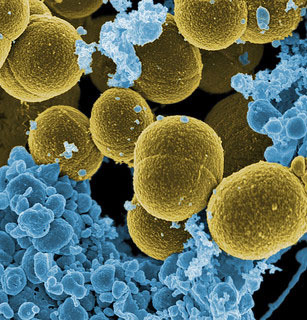 That knowledge has given rise to an industry dedicated to the eradication of bacteria—just take a walk down the soap and disinfectant aisle of your local grocery store, and you’ll find all manner of anti-bacterial soaps, wipes, and sprays. There’s no disputing the fact that we’ve been liberated and are safer from the scourge of unfriendly bacteria, at least to an extent. But at what cost? As the old saying goes, “No good deed goes unpunished.” Scientists now believe that we’ve become “underexposed” to bacteria and no longer build the antibodies, particularly as youngsters, that we once did to ward of future illness. (This underexposure also extends to viruses, such as rhinovirus which causes the common cold.) Consequently, we’ve seen a rise in allergies, asthma, and obesity. Yes, even obesity has now been linked to the overuse of antibiotics that has caused a reduction in a bacterium that inhabits our guts and regulates two hormones that, in turn, regulate appetite. It is this symbiotic relationship between bacteria and us—two life forms that need one another to survive in a state of health and well-being—that made me think in a slightly different way about the path our society has taken in its treatment of fathers as nice but not necessary. Our society is creating a huge, dangerous experiment as we systematically eliminate fathers from more families. And yet we’re conducting this experiment with the knowledge that it is doomed to fail. That’s where this experiment departs from our attempt to eradicate bacteria, and therein lies the problem. In the years between Fleming’s discovery of penicillin and the realization that we were overprescribing antibiotics to ill effect, we didn’t realize what we were doing. Doctors know now that they must be judicious in their use of antibiotics, although they certainly have some work to do and some of the effects of overuse might be irreversible. We know from reams and decades of research that DNA isn’t the only necessary ingredient from fathers for the creation of healthy children who grow up to be well-functioning adults. Their presence and positive influence as children age is necessary as well. In other words, children’s health and well-being depends on the symbiotic relationship they have with their fathers. Children can and do survive without fathers in their lives, but at what cost to them and our communities? We know that, on average, children from father-absent homes are at greater risk for a range of social ills. Communities with high rates of father absence suffer as well (e.g. high rates of poverty and violent behavior). And yet we continue with this dangerous experiment that we know will fail. Why is that? Especially when we know it has already failed so many children.